When Chubbles was rescued, he was instantly recognizable. His bright orange and white coat was stunning, but it was his overly large paws that drew attention! While most kitties have a total of 18 toes, Chubbles has 24! His adorable quirk combined with his lovable nature made him an instant favorite among volunteers. Chubbles loved to cuddle and would meow for non-stop affection from any human that he saw. After a checkup, he was estimated to be around 7 to 10 years old. The aging kitty doesn’t let his age slow him down, and seems to be partially fueled by hugs and cuddles! 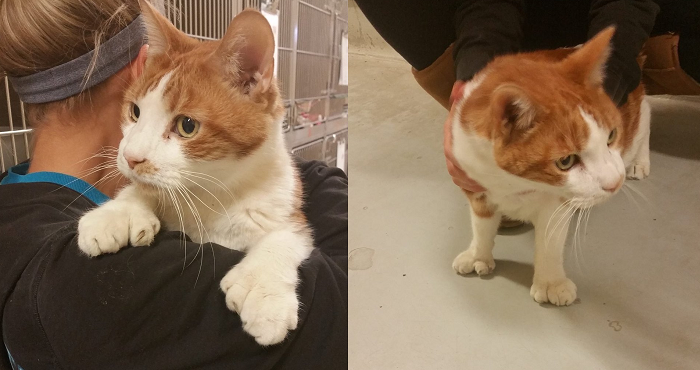 He had no problem when one volunteer sat down to examine his extra large paws to count each toe! The precious kitty doesn’t have any problems prancing around the shelter, but he hopes to leave as soon as possible. Having a loving home would mean the world to him, and while he isn’t sure where he’ll end up, he won’t mind as long as there are plenty of cuddles involved! Hopefully he finds a home soon!